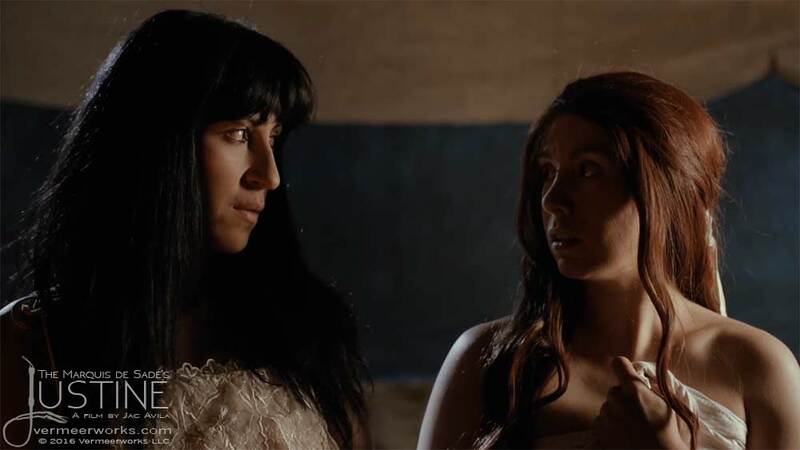 In this post, Mila Joya and Beatriz Rivera who play Rosalie and Omphale respectively in Pachamama Films’ Justine, talk about how they interpreted their characters. Director Jac Avila, who plays the evil Rodin, also relates how he viewed his role as the dominant figure in the film. Actresses in Jac Avila films endure the sadistic urgings of their tormenters, especially in movies like Maleficarum and the subject of this article, Justine. The film features a trio of alluring women: Amy Hesketh, Mila Joya and Beatriz Rivera. He remarks that the most intense scenes can take a physical and mental toll on the performers. “The whippings hurt, the crucifixions are very, very uncomfortable and even painful, there’s a lot of real suffering going on. I do not think that any of them enjoy that, they put up with it for the art,” he concedes. Jac summarizes his basic premise in creating Pachamama Films’ adaptation of Justine. “There’s no horror,” he explains, “except for the natural horror” that plagues humanity. As for the film’s theological comments, they reflect Jac’s Catholic upbringing. “Justine’s quotes about God and women come straight from the nuns that were my teachers in grammar school. They were Sadean in the biblical sense,” he comments. Let’s take a look at how Mila Joya, who plays Rosalie, and Beatriz Rivera, who plays Omphale, interpreted their roles. How did they see their characters moving the story forward? To set us up for their responses, Jac first explains his part in the production. The evil doctor’s “deranged whims” drive the film, Jac says. He is “god-like, as when god carries those attributes of power and evil” and “the “antithesis of Justine,” who narrates the tale. Mila offers her view of her part in the film. “Rosalie is a very interesting character because she’s the daughter of Rodin, there lies the big conflict, because of how ‘heavy’ [domineering] her father is. How she moves the story is complicated because there are moments where she loves Justine, she wants to help her but she can’t do anything. She knows she’s going to die, so she is resigned to her fate. In fact, Mila’s take on Justine, Rosalie, and Omphale is straightforward. “All three women are weak,” she insists. Though Rosalie’s helplessness and Omphale’s lack of insight into her own existence raise questions, De Sade avoids exploring the characters in-depth leaving the interpretation of how to play these women up to the actresses. The results are thought provoking in a highly recommended film. In our next post, we will examine how the players faced the challenges of Justine, including the torture scenes, and how the cast interacted with each other . . .
During the shoot . . . While taking a break . . .
And in conference to make sure everyone is on the same page . . .
Justine is available for purchase from Vermeerworks here.